"I have been very blessed to have worked with some of the worlds finest facilitators. And Lisa is certainly one of the most outstanding facilitators I have ever worked with." This journey with Lisa has given me back to the spark of creativity I let go of as a child. It has been a deep and meaningful process. There is no where to hide from what is emerging on the canvas. I can no longer deny the magnificence that lies within me. Lisa is an incredible facilitator who walks with you every step of the way. The turning point was how fast healing could be through the canvas. It reaches the psyche and soul much faster than reading, therapy or philosophy - it was mirroring my soul. I was astonished and shocked to find powerful the Emerging Woman workshop was! I really didn’t know what to expect but I found my time with Lisa to be very reassuring and truly empowering. With Lisa there with me every step of the way I discovered I could let go. And a beautiful aspect of me did emerge on my canvas. Being in retreat with Lisa is always a profound and beautiful held space. And has been one of the greatest gifts for me in recent years. I highly recommend diving in! I have a deep wish that all women have the opportunity to say YES to this incredible work…. It truly is the steps for woman to heal and know herself beyond current relationships. I’m in deep gratitude to Lisa and for all that she brings to the world. My experience of art journeys with Lisa are profound and provide a space for originality and essence to open in me - nothing else I have experienced in 14 years of self-discovery has given me this gift. CONTACT ME if you would like to book a One-on-One or if you could organise a small group for an Emerging Woman Journey. Join me at Ostara the Celebration of the Spring Equinox for an evening in Ritual and Celebration of ‘Edens Gate’. Gathering in a Circle of Sisters deepen and illume your connectivity to the bursting beauty of Spring and the flourishing, flowing quality of the Sacred Feminine. Come and Celebrate in the Spirit of Christmas with me in the Gallery and Studio for my ‘Christmas Gift’ - Shopping Evening. Join me at Samhain for a shared evening in Ritual and Celebration - Mystic Consciousness. Join me in the studio for an Art From The Heart experience session. A 'retreat' day for woman. Time to gather in Circle, To Pause, Reflect and journey in a creative dialogue with your Soul. You will also create a piece of artwork with subtle guidance and support using beautiful toned charcoals and coloured soft pastels on a large sheet of quality heavy art paper. Join me on this group journey and I will support and guide you in opening up your creative juice as you attune to recognising your inherent creative ability. 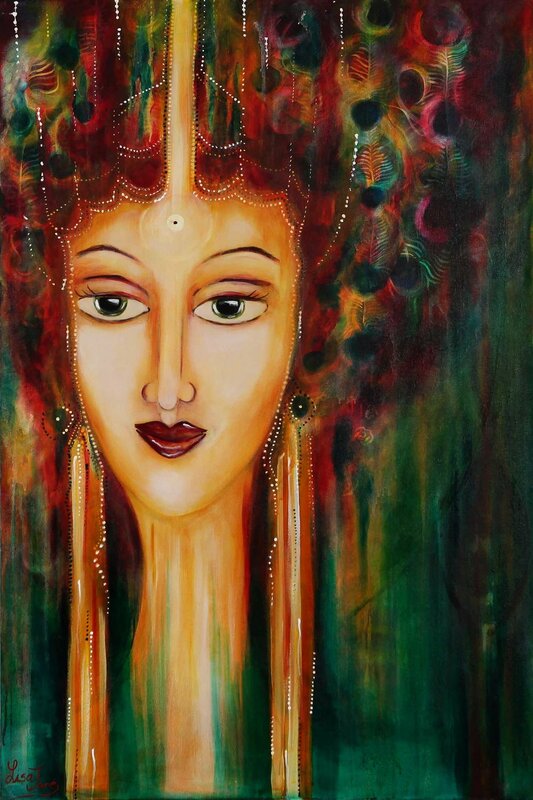 Painting the emerging feminine essence in you awake and creating a stunning canvas unique to you to take home. In this group journey with me I will support and guide you in opening up your creative juice as you attune to recognising your inherent creative ability. Creating a stunning canvas unique to you to take home. View some of my works in my next Exhibition.